Use Restrictions: For residential use only. Point spray away from people, pets and plants. Do not use as a room spray. Remove pets and cover aquariums before spraying. Do not allow the spray to contact food or food-contacting surfaces. Do not allow people or pets to contact treated surfaces until spray has dried. Thoroughly wash dishes, utensils and countertops with soap and water if they are inadvertently sprayed with this product. Shake well before using. Spray surfaces until damp, moving the spray rapidly to prevent excessive wetting and waste of product. Treat areas where insects are commonly found, such as cracks and crevices. Ants: Treat around doors, around window frames, ant trails and other areas of entry. Fire ants and pharaoh ants must be sprayed directly in order to be killed. Fleas: Fleas must be sprayed directly in order to be killed. 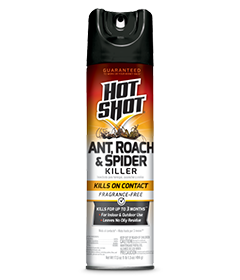 Spiders: Spiders must be sprayed directly in order to be killed. All outdoor applications to impervious surfaces such as sidewalks, driveways, patios, porches and structural surfaces (such as windows, doors and eaves) are limited to spot and crack-and-crevice applications only. Shake well before using. Spray common insect entry points around buildings. Spray around door frames, window frames and screens, porches and patios. Ants: Spray ant hills, nests, ant trails and other areas of entry. Fire ants and pharaoh ants must be sprayed directly in order to be killed. Point spray away from people, pets and plants. Pesticide Storage: Store in cool, dry area inaccessible to children and away from heat or open flame. Do Not Puncture or Incinerate! Pesticide Disposal and Container Handling: Nonrefillable container. Do not reuse or refill this container. If empty: Place in trash or offer for recycling, if available. If partly filled: Call your local solid waste agency for disposal instructions. This pesticide is toxic to fish. Do not apply directly to water. Contents under pressure. Do not use or store near heat or open flame. Do not puncture or incinerate container. Exposure to temperatures above 130ºF may cause bursting.